Design and build a home that fits you perfectly. What are you looking for in a home? Think about which spaces in your home you use most. Do you do a lot of cooking, entertaining, artwork or just relaxing? Where do you spend most of your time? We'll work with you to figure out how to best utilize your space. Many builders will build the largest home they possibly can, within a budget, which gives the appearance of a good value with a lot of square footage. But in reality you are paying for a lot of wasted space. 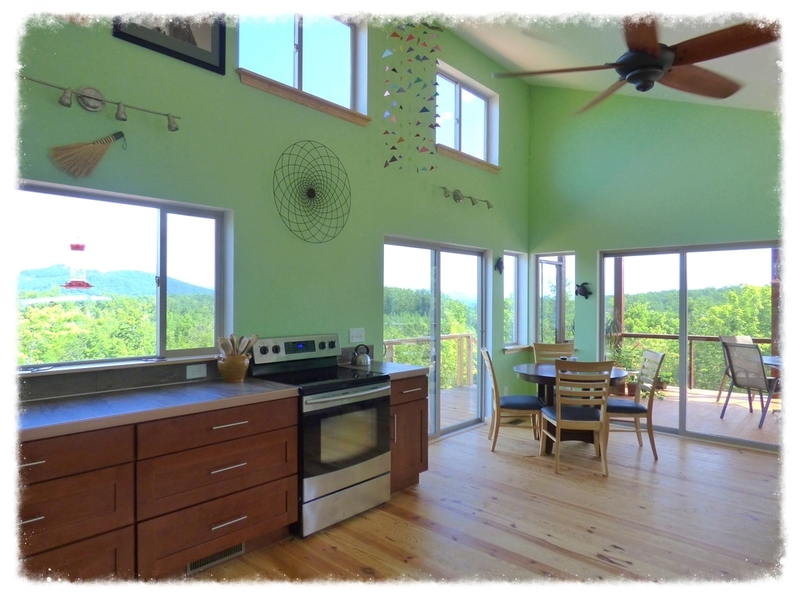 We will build you a home in Western North Carolina that gives you more useable space with a smaller footprint. There are many ways to make a small home feel bigger. Adding windows gives you more light and it brings the outdoors in, extending your perceived living space. Outdoor living areas, such as a deck or porch, will give you more room that costs less than interior space. Making rooms that serve multiple uses will free up space. Many times people create hallways in rooms and don't even realize it. Eliminating those can save more room. Be sure to have plenty of closet space. A small home still needs storage. Get more home in a smaller package. We believe a smaller home is better. One reason is that it costs less to build a small home. It takes less energy to heat and cool the space. You will pay less in taxes. When you build a smaller home you can spend some extra money on the space that you do have, which can let you do some upgrades if you choose and stay within your budget. Another great benefit is that it takes a lot less time to clean a smaller home. And, building a smaller home is much more sustainable and reduces your footprint on the Earth. By 2010 the average home size ballooned to over 2400 square feet, more than double what it was in the 1950's. Today there is a trend towards downsizing into more modest sized homes. Think about the space in your home that you use every day. How much could you reduce each room by? What rooms could serve multiple functions? Where can you create extra storage areas? We will help you make the most of a smaller space. Even if you don't live where we build, we can still help you design a home that fits you perfectly. We added bookcases and kitchen storage under the stairs to the loft. Every little bit helps in a small house. Another thing we added was a bookshelf in the bedroom. It goes along the top of the wall, so it utilizes unused space and gives us quite a bit of space for books and nic nacs. We built a small home because we wanted to cut our bills while creating a space that fit our life. While we admire the people who live in Tiny Homes, we need a bit more room. 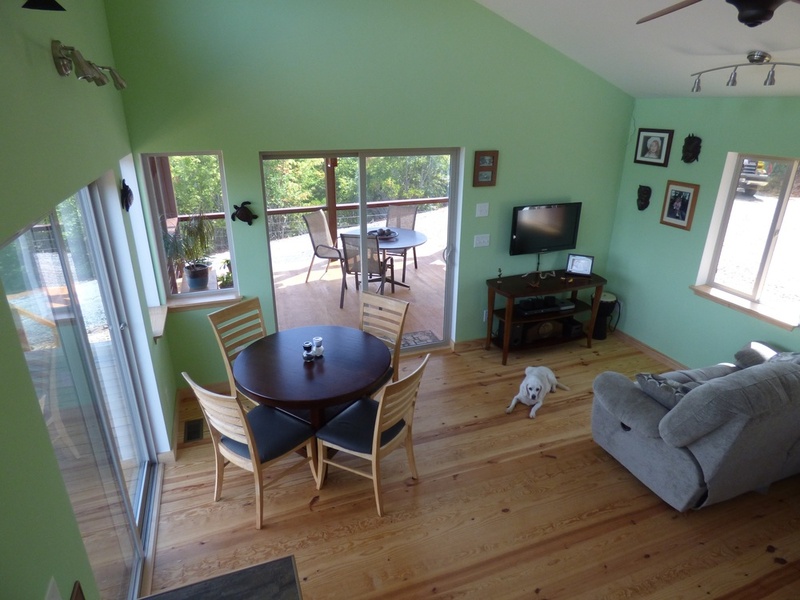 Our goal was to have a home that is easier to clean and cost less to heat and cool. We spent a lot of time thinking about what we do in each space and where we could cut the footage. For us, a good sized kitchen is important for making blackberry jelly, canning fresh applesauce and preserving our herbs and veggies. We trimmed the bedroom down and used an open floor plan to help us fit it all in. A screened porch is important to us so we can spend more time outdoors, even when the bugs are hungry. We would love to sit down with you to help you figure out what size home you can live and thrive in. 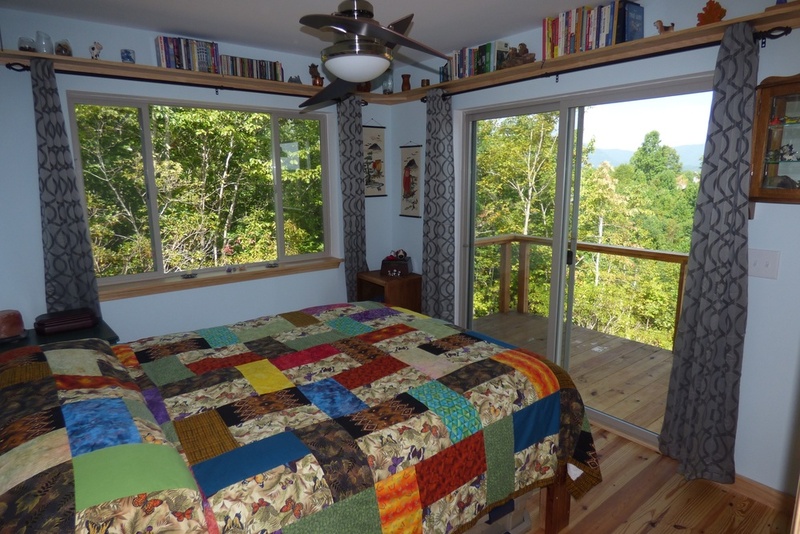 All of the pictures on this page are from our 704 square foot home near Lake Lure. You are welcome to come visit and maybe our small home will help inspire you. Another goal of ours was to build a green home, so we've incorporated many green ideas. Our home doesn't have any green certifications, but it was built with sensible improvements that have a good cost return. Some of the green certifications can cost over $5000 and we would rather spend that money on our home. All of the windows and doors are Energy Star rated for efficiency, and all of our appliances are also Energy Star rated. Most of the lighting uses LEDs and the rest are CFLs. We built our home with 2X6 walls for added insulation and used passive solar ideas to help heat and keep our home cooler. Orienting our home in relation to the sun has made a big impact on reducing excess heat during the summer. Using natural materials whenever possible gives us an excellent indoor air quality. Most of these ideas can be done on a modest budget, but have a big return. Simply Home is an offshoot of Hughes Construction. Wally and Shawna Hughes are the owners of the business. Wally is a licensed and insured General Contractor in NC with 30 years of construction experience. Shawna's creativity helps in designing the homes and she does much of the administrative part of the business. We have built homes in Buncombe, Henderson, Polk and Rutherford counties. We prefer to build small and efficient homes. The profit may not be as big as building large homes but there is lots of satisfaction knowing we are building a quality home that reduces it's footprint. There are 4000 square foot homes that are Gold LEED certified but they still use a lot of energy and used an enormous amount of resources to build. That doesn't feel too sustainable to us. We are not a high volume builder. Even when building was at it's peak, the most homes we built in a year was 5. Our focus is on personal service and making sure your home gets the attention it deserves. With proper oversight and sensible scheduling we can promise your home will be done within 6 months. Most of the homes we have built have been done in under 4 months. By building a smaller home we have more time to enjoy doing things we love. Living in WNC gives us lots of places to go hiking and kayaking. We also like to garden and cook. Moving into a smaller home has been a challenge but not as tough as you might imagine. Our daughter, Alexa, is attending Appalachian State. We also share this space with 2 dogs and 3 cats. We have a place for everything we need and it is peaceful having less clutter.